Ostomy Paste, manufactured by, Coloplast provides a tight sealing around the stoma for patients with an ostomy. Patients with an ostomy typically utilize pouch systems. Ostomy pouch systems involve attaching a barrier or flange to the skin so that a pouch can be connected. One piece ostomy pouches can also be used which have the barrier permanently attached to the pouch. Barriers or flanges need to adhere to the skin in order to develop an effective seal for the ostomy system to function efficiently. 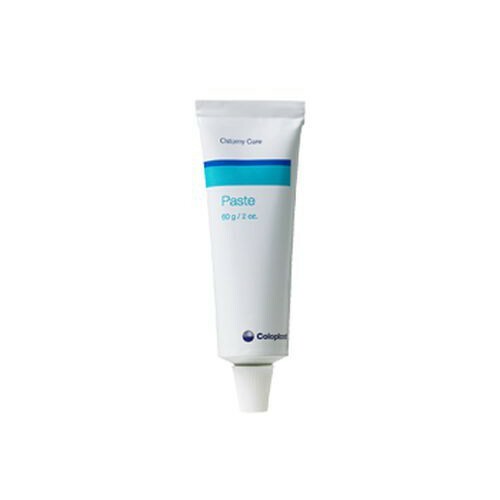 Coloplast Ostomy Paste is available for SALE at Vitality Medical and can be used to fill in uneven skin surfaces allowing the barrier to get a proper seal. This product helps to minimize the risk of maceration. Maceration is the condition where the skin becomes mushy and wet in appearance. The skin breaks down and left untreated can advance to more problematic skin conditions such as infection. A great way to minimize this condition is to keep the stoma and surrounding area clean and dry. This is accomplished with the use of proper fitting barriers or flanges and a protective ostomy paste. Coloplast Ostomy Paste features an additional benefit of providing a a tight seal around the stoma helping to prevent stoma output. Stoma output is when the flange is not properly adhered to the skin which causes unwanted leakage. This leakage can be easily prevented by a applying ostomy paste to provide a tight fitting seal of the barrier to the stoma area. This can also extend pouch wear time and minimize skin irritation. Get a better fit for your ostomy pouch system. 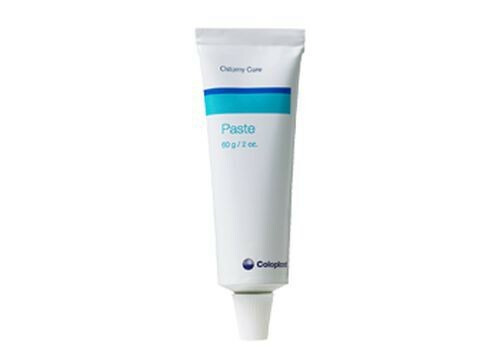 BUY Coloplast Ostomy Paste from Vitality Medical today. Is there an ingredient list on this product? I need to ensure it is safe for use in a Hyperbaric chamber. The ingredients listed on this product are as follows: 2-BUTENEDIOIC ACID, MONOBUTYL ESTER POLYMER W/METHOXYETHENE, TRIACETIN, CARBOXYMETHYLCELLULOSE, GELATIN, PECTIN, GLYCERYL TRIS 12-HYDROXY STEARATE, ETHANOL, BUTANOL, N-BUTYL ALCOHOL, PROPYL CARBINOL, and BUTYL ALCOHOL. Is this paste alcohol free? This paste does contain trace amounts of alcohol. I like Coloplast Ostomy Past because it hold my appliance in place, even with rigorous exercise. my appliance intact, so well, I will continue to use it.